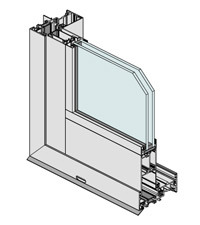 Series 731 incorporates Thermal HEART™ technology giving a true wide thermal break between the outside and inside faces. WERS (Window Energy Rating System) data shows that using the same IGU in a Thermal HEART™ awning is 32% more efficient than a standard non-thermally broken window. Thermal HEART™ will accept insulating glass units up to 32mm thick. The typical IGU thickness is 24mm. We offer Thermal HEART™ in a range of stocked colours including dual colour ClearMIST™. The door panels run on heavy duty double bogey wheels as standard. For the ultimate finish the perimeter frame has snap-in flat fillers to close off all unwanted recesses. These fillers are isolated to prevent thermal transmission from inside to outside. The flat sill is ideal for recessing into the floor finish. This sliding door has been tested for compliance with the relevant Australian Standards and achieved a high water resistance of 300Pa, this makes the product suitable for most residential applications. We also tested the maximum size door panels and ran them through to destruction to make sure. The extra strong door stiles allow large door panels to be fabricated.